Having warmed up we headed up to Inveraray. 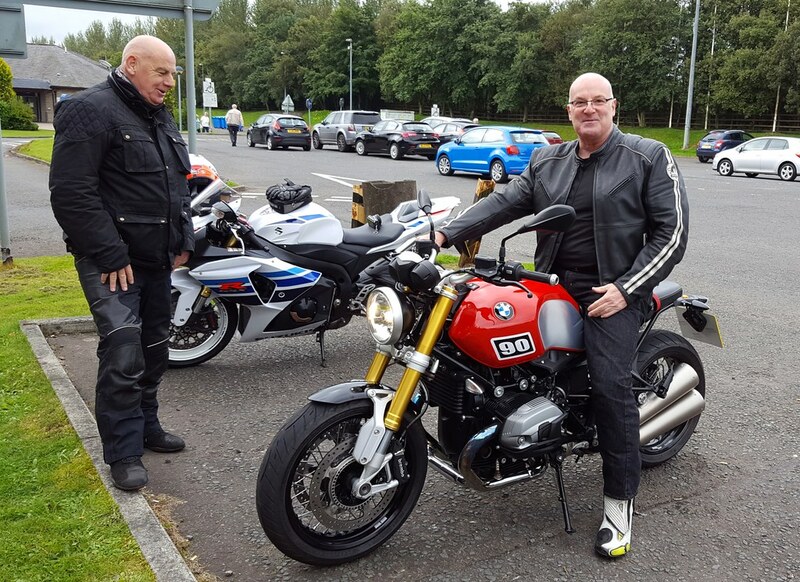 This ride feels significant as I, Ally, Stewart and Stevie hadn't been out together since we lost Jimmy down near Dumfries. Neil Claydon, TreasureState, ullukk and 3 others like this. 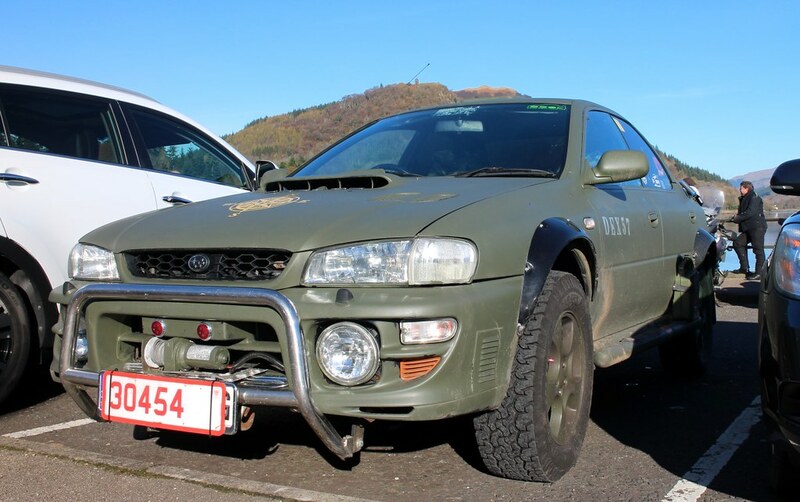 While at Inveraray we met this beast of a vehicle which was certainly off road ready. Which reminds me, while the roads were reasonably dry yesterday there was one occasion where the verges were coated with frost which was a little disconcerting. At that moment I thought, perhaps being on the sports bike or any bike wasn't the best idea! TreasureState, hondated and bubu like this. 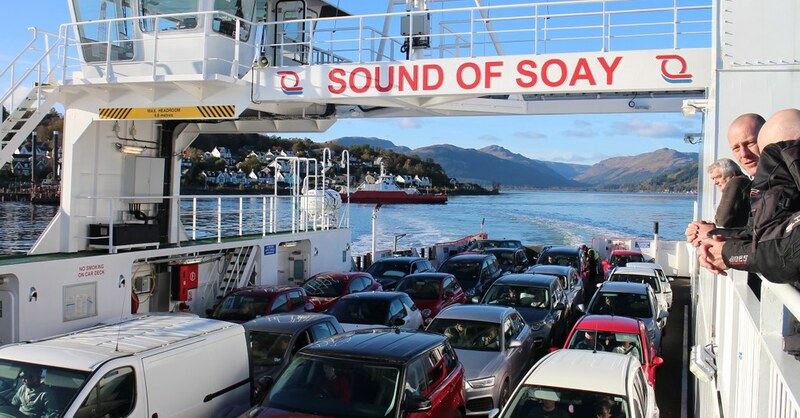 We then head back down the A815 toward Dunoon to jump on the ferry back to Gourock and home. MadRider777, tweise, TreasureState and 4 others like this. TreasureState, ullukk, hondated and 3 others like this. grashopper, Kamchat and hondated like this. Nice to see someone is the same as me and uses handlebar muffs rather tan worry what they look like Sarah. Looks like you could be getting the mountain bike back out soon Sarah. Lol there's nothing wrong being sensible, and being warm is far better than being frozen! 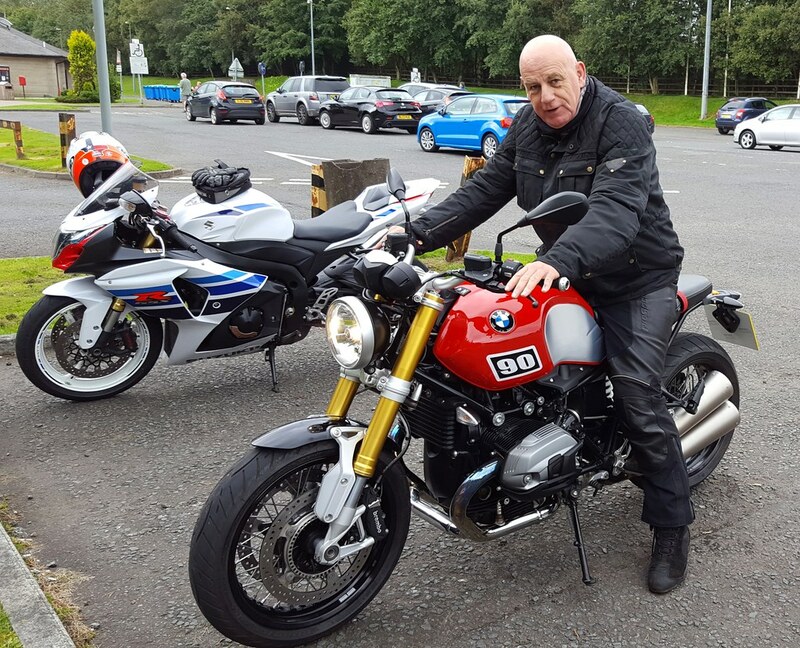 After two weeks of ownership, Dave tells me that this was the R Nine T's first proper run back in September 2016 and thankfully Dave managed to capture a couple of photos with Kam/ John and Jimmy sizing up his new ride. TreasureState, Oms, hondated and 3 others like this. TreasureState, Oms and Kamchat like this. After someone dies, it is normal to grieve the past as well as your hope and dreams for the future. Since your loved one has died, you will mourn for all the things you had dreamed of sharing with them'. I grieve very deeply for John and that pain runs so deep at times it feels infinite and I so miss having that shared passion of riding and bikes (and much more), we had together and it was through biking we met all those years ago. Having seen my whole future vanish over night, it was initially hard going out on the bike again but then it felt good as I felt I had regained something back having seen my world disintegrate. I agree riding has helped with the healing, as it makes me feel much closer to John and it's good to be with a group of like mind individuals too. 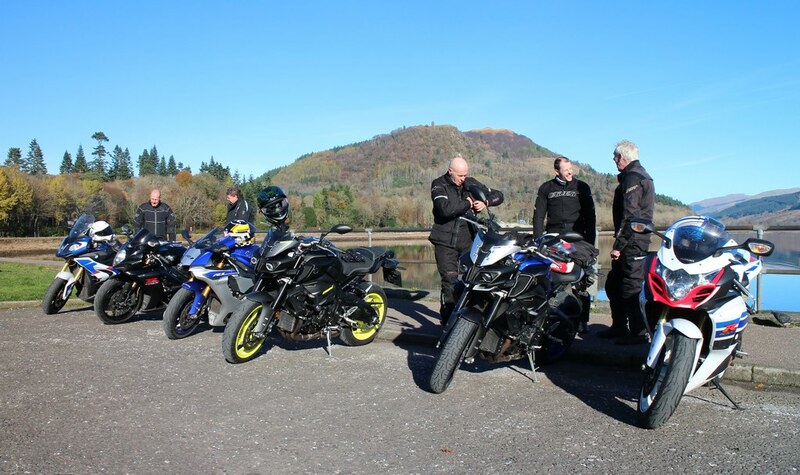 Unfortunately with winter is on the doorstep in Scotland our rideouts will become few and far between (it's a bit too chilly here after October normally). However the crew and I will be out again in the Spring, but in the meantime I, we have a few photos from this summer to post. Here's a couple of photos from 2013 when John and I woke early to ride up to Sanna Bay on the West Coast of Scotland. You can see back then he had a different 1000 and I on my K6 750.
grashopper, burrenman, ullukk and 7 others like this. A french writer, Antoine de Saint Exupery wrote "on ne voit bien qu'avec le coeur" "we can only see fine with the heart"
TreasureState, ullukk, Kamchat and 2 others like this. Having seen my whole future vanish over night, it was initially hard going out on the bike again but then it felt good as I felt I had regained something back having seen my world disintegrate. I agree riding has helped with the healing too, as it makes me feel much closer to John and it's good to be with a group of like mind individuals too. yes winter is arriving, but the spirit is still here, and dreams to the futur rides is really important. I know dear Sarah, someone will miss a lot in those dreams, but I am sure when i say "John would see you on bike, and dream about futur rides"
Thanks so much for posting those pics, and some of your thoughts Sarah. It's not easy to be honest and vulnerable like that and I appreciate it, but I guess you have a big virtual, online support group wishing you well and hoping all the best for you too so that's who you respond too. My wife fell backwards on an icy sidewalk (Alberta, Canada) bashing her head, she was on long term dis from her job for 3 full years. Out of every 10 days she would literally have 9 migraines. We eventually got the right doc who did a procedure in her head, reduced headaches down to 1 or so every 10 days. Long story short she had to deal with all that pain on her own, nobody could really know the hell she was going through. Likewise you, you have lots of support but when you're sad and on your own and missing John it must be crushing. Hang in girl. On the brighter side, it's nice to see pics with John included. We didn't see many pics of him over the years, for obvious reasons. He's a strong looking guy, no nonsense but likes a good time and to laugh. And you're riding his 1000? Wow, great respect. 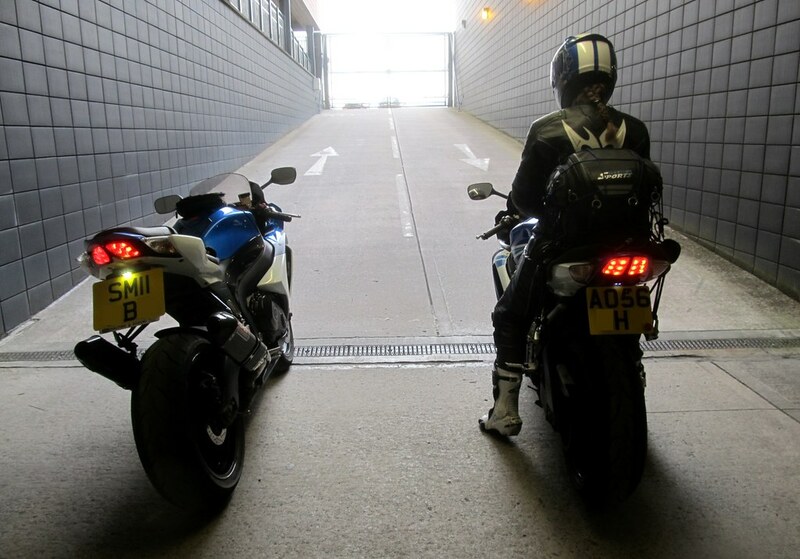 Fastest bikes I had was a Blackbird, GSXR1100's and now have a TL1000S. Your K1 is a huge leap over any of those. Good stuff. And..........the blog you guys wrote. I clearly remember the day I first read it. You probably had less than 8-10 months of posting. Of course the title of the thread and then 3 lines in he's talking about RD250's. Hooked, lol. 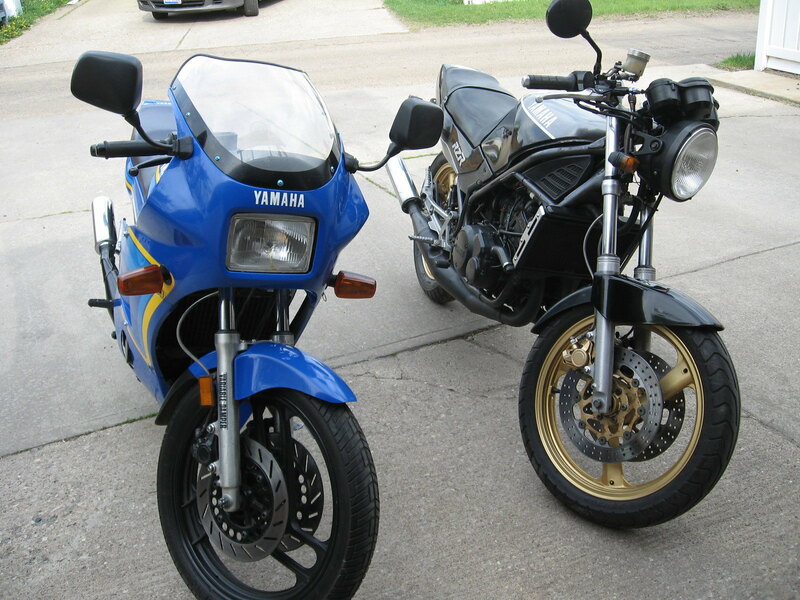 I've had many 2 strokes, here's a pic of 2 of them from about 8 years back. 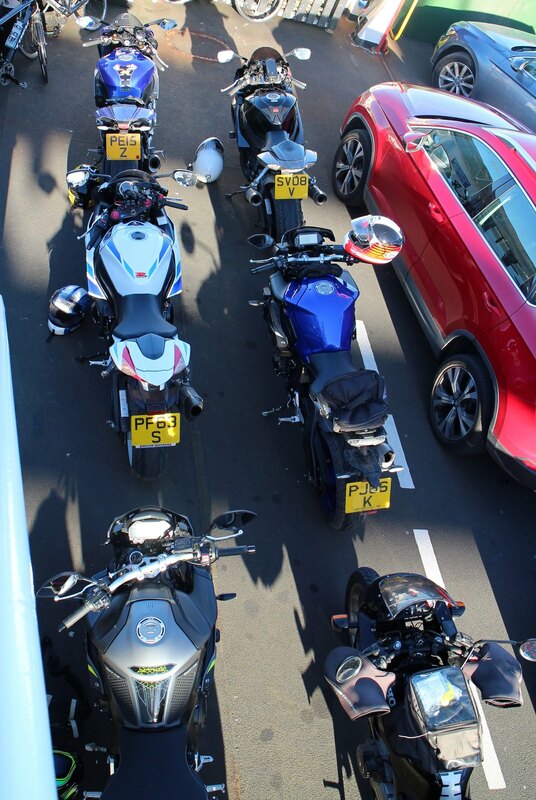 We too are into winter, bikes are put away, sigh. Anyway, kinda rambling a bit here but wanted to thank you for sharing. TreasureState, Kamchat, hondated and 1 other person like this. Crash111, Sarah and John are the most fabulous persons i ever met!!!! Real big heart full of gentleness and sweetness!!! Kamchat and hondated like this. TreasureState, Kamchat and hondated like this. Hi Bubu, Seb :) Thank you so much for posting the photos and I particularly love the photo of me on the bike with John. Its good to look back and be reminded of those good times. For many many weeks (months probably), my mind was occupied by the shear loss, it still is to a greater extent. But I have started to remember those good times and I can smile, and I be honest I do find myself shedding a tear because it is hard knowing those wonderful moments will never be repeated with John. TreasureState, BigEasy and bubu like this. I hope your wife is feeling better following her struggle with the migraines and I can only imagine lonely she felt trying to cope with them. I know they can be very disruptive to a person life. I have to admit I am lucky to have much support on the internet and it does make a difference especially as I do live alone, well no quite there are Kito and Scotty the two cats. It has been hard being honest when it comes to loss however as I was to understand, to even start grieving properly we have to be honest to ourselves so we can deal with it and the raft of issues surrounding it. But it's and pardon the pun being a bike forum, it is a long road to recovery. As an example last week I got a puncture cycling to work and normally I would have called John to help me. On the surface it doesn't sound much, but that support I had had from John, knocked me significantly and that realisation of John not being there left me sobbing on and off for the rest of the day. I did get it all sorted, but it emphasize that void in my life. Good to hear your liking the photos of John, he did spend more time behind the camera rather in front of it lol. But occasionally he would allow having his photo taken and so he should since he always insisted taken photos of me and the rest of the crew. He was a strong guy, he had a wicked sense of humor, but ultimately he was kind and believed in fairness, though he did like to cheat at games! so he was quite competitive too! Love the bikes and thank you for posting them I love the Blackbird, my ex had one which I was pillion on until I decided to ride myself. 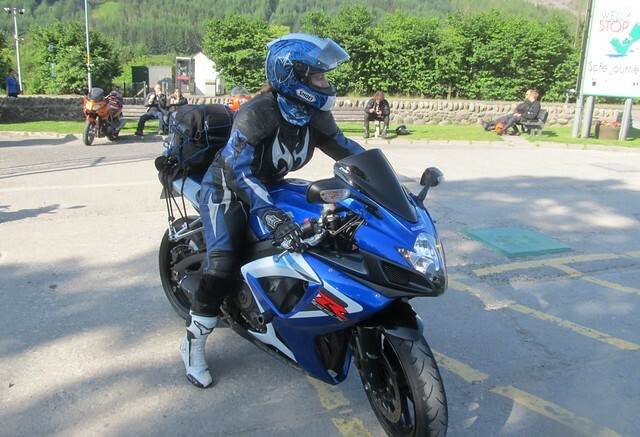 As for the GSXR1000 aye it's a wee rocket lol and it's gorgeous to ride. 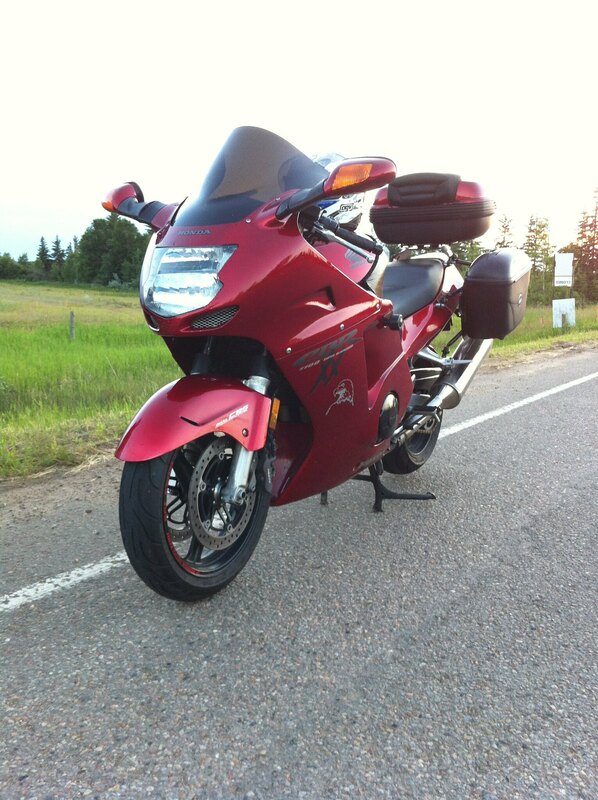 I loved my 750 very very much, in fact the K6 I had from new and I never wanted to replace it. But I am enjoying the 1000 very much..... but those white wheels are a challenge keeping clean!! lol. 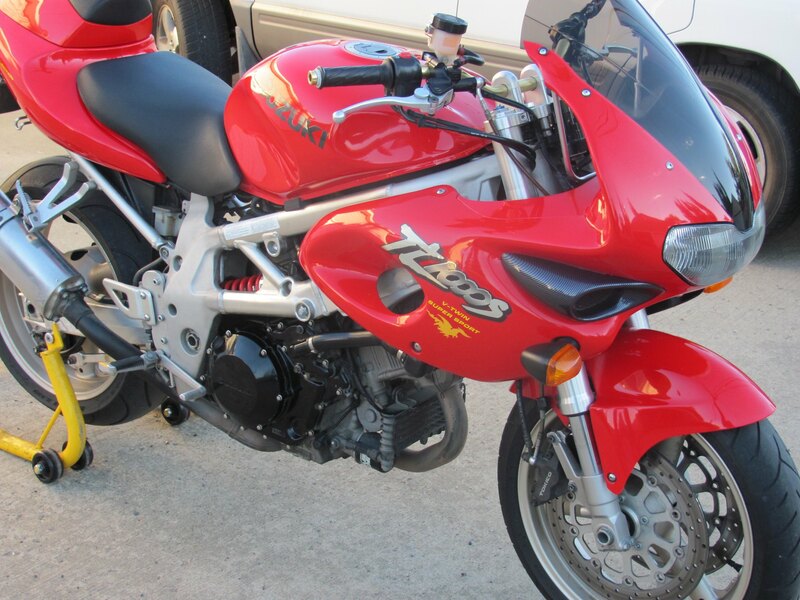 RD250s are before my (riding) time and my first bike was a Kawasaki ER5, after that it was a Thundercat, then the K6 750. 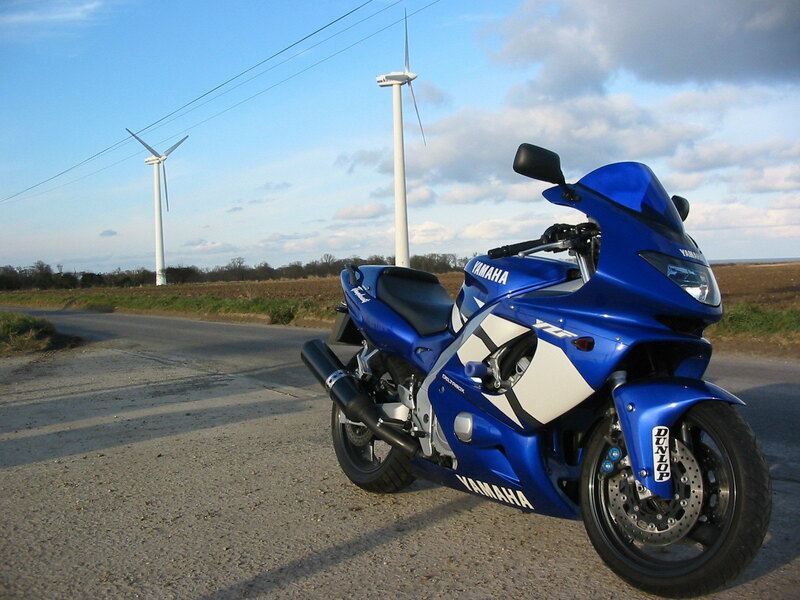 Though I ridden a handful of other machines including the ZZR1400, engine size hasn't bothered me so much but I will admit being short, the height of a bike can be a problem lol. Mediocre Man, TreasureState, bubu and 1 other person like this.